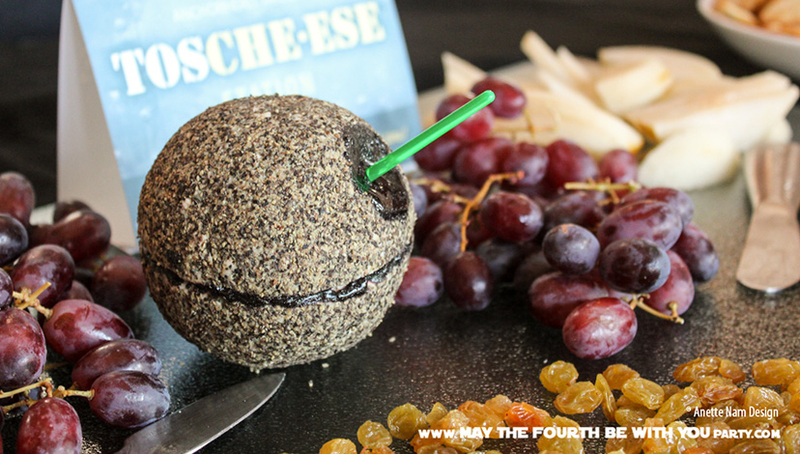 When we were working on putting together the Tosche-ese Station, I was trying to figure out which cheeses mold well, so I tried lots of different varieties. Some worked great, some were complete failures, and one ended up a happy, yummy accident. I should have known that Roquefort would not mold well – it separated into oil and globs when heated. I tried a new batch o’cheese and simply mushed it in a silicone mold – it just wouldn’t not stay together when I later tried to get it out. Freezing it would probably have worked, but would have compromised the flavor too much. So after melted and slimy stormtrooper heads, a disintegrating millennium falcon, and blue cheese up to my elbows, I took all the cheese crumbs and, in my frustration, squashed them into a big ball. Heywaitaminute! That looks like a Death Star! I rolled it into a ball. The shape was good, but after all the squishing it looked a bit unappetizing. So after about 15 minutes of brainstorming, there was a BIG pile of pepper on my kitchen counter, and the Death Star was feverishly being rolled in it. PERFECT! The real hard part, was to get the markings on it. I tried food markers. That did not work on the pepper. I tried just carving it, but that didn’t show up. Eventually I ended up using black ready-made cookie icing, on top of my cut-outs. A green lightsaber-pick made the illusion complete. That first test ball was with a cheese-of-the-month Danish cheese from Trader Joe’s called Sky Blue. It was simply amazing. Unfortunately, that was sold out by the time we made our party cheeses, so we ended to using a regular old Blue Cheese. Pour pepper in a big pile. Squish the cheese and roll into a ball. Roll the ball around in the pepper until it is evenly covered. Cover with plastic wrap and put in the fridge to cool (so it gets harder). Cut the Equatorial Trench and the Superlaser Focus Lens, then fill it with the icing. Break the hilt off the lightsaber and stick it in the Focus Lens. Put back in fridge until the icing solidifies. Then cover with plastic wrap again. Let you kids help. Or rather, let them make their own. This is such a fun activity! As with most cheeses, let it sit out and get close to room temperature before serving. Check out the rest of our Tosche-ese station here. Tosche-ese Station Sign to download. This is SO clever- love it! Thanks for sharing!